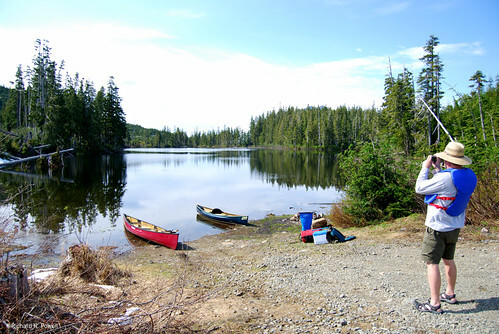 Yesterday I visited the 100th Lake in my exploration of lakes on Vancouver Island. Of those 100 lakes visited I paddled 54, some more than once (Trail Pond, Turtle Lake, Mohun Lake, Bear Lake, Somenos Marsh, and Westwood Lake). The reasons for not paddling 46 of the 100 were varied. Some had no easy access, or the lakes did not look interesting, or I didn't have sufficient time to paddle the lake on the day I was there, or I ended up paddling somewhere better. Of the lakes visited but not paddled, I plan to paddle 24, but only 10 are high on my list. I still have about 30 other lakes to investigate first. I expect to paddle another half dozen before 2009 comes to an end. Of the 54 lakes paddled so far only a handful were less enjoyable than I expected before visiting them, and only three actually disappointed me (Cedar Lake, Hawthorn Lake, and Darkis Lake). Some others such as Dougan and Echo Lakes turned out to be prettier to look at from the highway than to paddle on (and both suffered from excessive traffic noise). Afew turned out to be more rewarding than I expected. Anutz and nearby Atluck Lake both overwhelmed me with their interesting shorelines and scenery while Spirit and Grace lakes provided a sense of remoteness and peacefulness that was out of proportion to their setting. Subtle beauty and a satisfyingly untouched quality seem to be the reason for these shallow quiet lakes charm. Some urban lakes turned out to have surprisingly natural shorelines (Thetis Lake and Westwood Lake) while some wild lakes suffered from overuse as evidenced by severely trampled and eroded shorelines (Spectacle, Peak, and Twin Lake). I have learned how much water level can effect the feel of a lake. Somenos Lake dropped 4 or 5 feet over a few months changing the paddling experience significantly, and the exposed beaches of Buttle, Elsie, Darkis, and Klaklakama Lakes detract from otherwise promising locations. Some of the jewels of the island felt vulnerable and fragile. 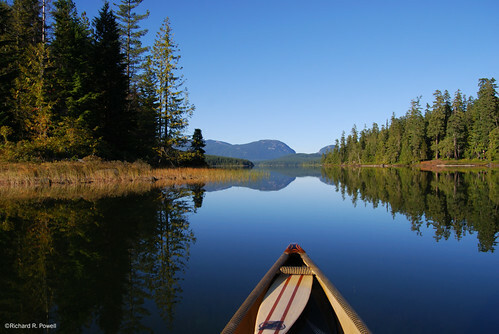 Mohun and Amor lakes are world class paddling destinations yet active logging throughout the Sayward Forest threatens to reduce the recreational value significantly. Many areas are closed for logging and I will be returning after the fact to see what is left. This whole area should be protected for posterity now. While the logging that is going on is responsible, it's just too pretty an area to scar with clear cuts. Other gems, like the swamps and lakes of the Stamp and Ash valleys are on private land and at the mercy of the giant forest companies who own them. Pat Bell, minister of forest and range, said in response to recent questions about the status of large trees on Vancouver Island that sufficient old growth is already protected - the rest is free to be logged. This comment reinforces his January declaration that the old growth ecosystem is amply protected. Mr. Bell sees no reason to protect more forest from the saws. I do. I witnessed in July of this year one logging truck on the Cowichan Highway (Hwy 18) with three massive tree trunks filling it's trailer. These are very large old-growth trees, and the loggers are obviously active in our woods getting every last one. 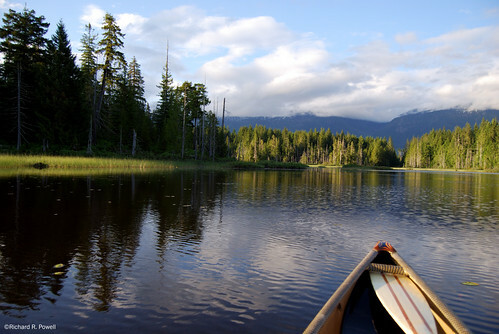 I need to learn more about the BC government system and discover if it is possible to bring the aesthetic quality of our wetlands and forest into focus before it is too late. How can such beauty be destroyed for the profit of so few when if they are protected they can benefit so many for so many years to come? Surely money isn't the only abstract construct that can be extracted from these locations. Should poetry, tranquility, and the healing power of nature feature in my writing? 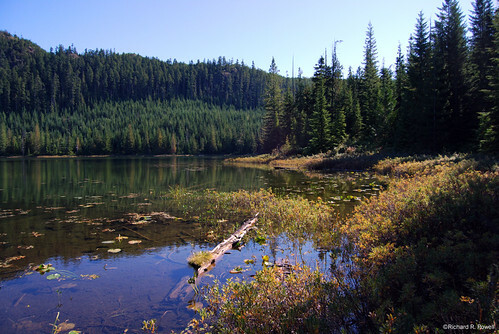 A lake without a large clear cut beside it is significantly more attractive than a lake with a tiny ribbon of trees between it and the surrounding expanses of dead stumps, slash, and torn up soil. Will it help to paint this picture? Can my writing and photography have any effect? Wow, Richard, you achieved your stated goal of 100 lakes. I am very impressed. I sure hope your blog makes a political impact. One thing that your blog has achieved is that it has given me joy. Thank you for creating it and maintaining it to this point. Thanks Judy, I was surprised to discover I had visited 100 lakes already. Of course now I want to paddle 100, but that goal is still a ways off. I appreciate your comment and thank you for reading. It is great to have a voice, isn't it? Blogging is so gratifying.